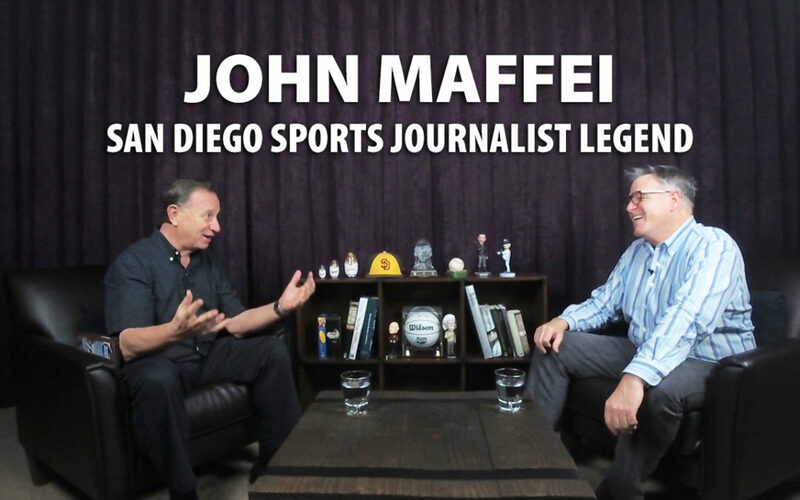 I was so pleased to enjoy a conversation with San Diego sportswriter legend, John Maffei. John is a 50-year veteran in sports journalism, an athlete, a coach and a major behind-the-scenes person that has made a significant, positive impact in the San Diego sports community. We spent time learning about John’s life. Born in Chicago, raised in Pasadena, went to La Salle High School, recruited to play baseball at St Mary’s but chose to play at Pasadena City College and later at San Diego State. John Maffei shared his memories as a teammate of Darrell Evans while at Pasadena City College. Evans’ talent helped lead their baseball team (and basketball team) to state championships. Evans played professionally for the Atlanta Braves, San Francisco Giants and the 1984 World Series Champion Detroit Tigers. John Maffei formed a strong relationship with basketball coaching legend Jerry Tarkanian who was the head basketball coach at Pasadena. John was a part of Tark’s support staff helping him keep the game book while John was not playing baseball. Tarkanian offered John a full ride scholarship to Long Beach State when Tark was hired there (prior to his career at UNLV and Fresno St), but John politely declined the offer because he wanted to keep his baseball dream alive. We spent time going down memory lane of John’s time at San Diego State as the sports editor of the Daily Aztec and player on the baseball team. John shared a special relationship with football coach Don Coryell and helped him recruit athletes to play for the Aztecs. John Maffei spoke at length of his time as a manger in the California Collegiate Summer League where he played against incredible baseball talent including one game facing both Mike Scott and Jesse Orosco in a double header. We touched on a baseball tour he did Alaska playing in the Midnight Sun games, including sharing fun memories of Bob Moss (Hubba Jubba!). No story of San Diego sports is complete without recounting wonderful stories of Hall of Famer Tony Gwynn. John Maffei shared his special moments with Tony in the Padres dugout after batting practice and sharing Tony’s desire to make a positive impact with each fan he interacted with. It was fun to discuss so many incredible athletes from the Poway, Rancho Bernardo and Rancho Penasquitos area including Tony Gwynn Jr., Cole Hamels, Trevor Williams, Eric Chavez, Jaime Jones and Billy Beane. We shared stories about both Deron and Dominick Johnson, including Dom’s incredible talent as a basketball player before becoming a modern-day pitching guru on par with Tom House. I am leaving so much out in this written summary. We also shared stories about John Wooden, the San Diego Sports Arena, the 2019 Padres outlook and their minor league system, Qualcomm Stadium, Rashaan Salaam, La Jolla Country Day High School, Marcus Allen’s incredible performance in a CIF title game, Ricky Williams, Alex Smith, Rancho Bernardo vs Montgomery baseball, Kevin Towers and so much more.